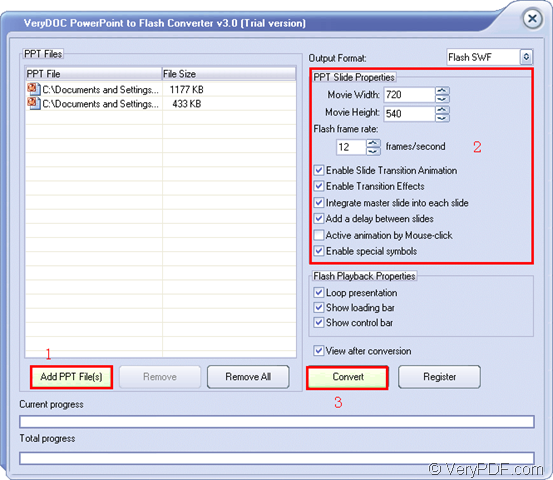 The application VeryPDF PowerPoint to Flash Converter allows users to convert PPT to SWF flash file as well as retaining the animation effect of original PowerPoint document. Like the slide transition effect, adding delay between slides or you can also activate the animation by mouse click. In addition, in created flash movie from PowerPoint, you will not lose audio effects of the original presentation documents. VeryPDF PowerPoint to Flash Converter can retain sounds for animation effects and slide transitions in WAV, MP3 and other audio formats. In order to use this application, please click the following button to download the free trial version and then please double click the installer and follow the setup wizard to accomplish the installation steps. When you open the application, you will see the main interface of it on your screen and you can use drag and drop operations to add PPT document into the application. According to your requirements, you can check any box before each option. Please see the conversion process in next snapshot. At last, please click Convert button to start to convert PPT document to SWF and you need to specify the output location for target SWF file in the popup Save as window. 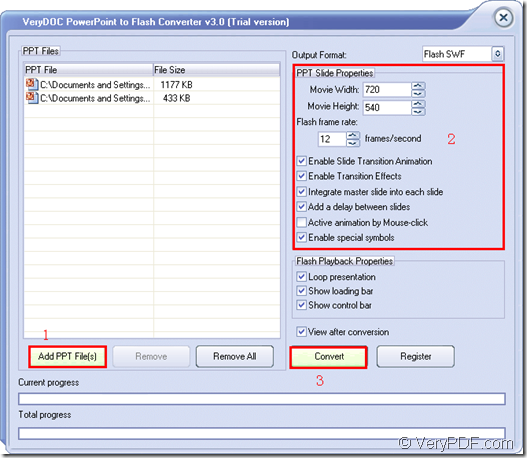 In the specified location, you can check your created flash movie after the conversion from PowerPoint to SWF. If you are interested in VeryPDF PowerPoint to Flash Converter, please click the button below to download a free trial version to your computer to have a try. If you are satisfied with the functions of it, you can choose to purchase it. This entry was posted in PowerPoint to Flash and tagged PPT to SWF. Bookmark the permalink.